There are various spots in my home that I simply love. In a previous blog called The Woman Cave, I talked about how I carved out a little space for writing, contemplating and all sorts of stuff. This is where I write mostly. I also have a bulletin board where I put things to remember and pictures and quotes that inspire me. Above my desk is a little inspirational corner with some spiritual books I like to refer to from time to time. If I glance to my right, a Harry Potter hangs to represent my geeky side. (Snorts and pulls her glasses up over her nose). I try to make coffee for Brian every morning before he goes to work. I put a little picture above the coffee maker with a saying from Buddha on it. "The mind is everything. What you think you become." This quote greets me in the morning and sets the tone for what will transpire as the day unfolds. Speaking of Brian - he's the best part of living in our house. Oh yeah, don't forget to glance back at the bulletin board at the top to see a picture of me and my brother Naje in DC visiting my other brother Corey. Isn't he handsome? His website is here - Tampi.com. Being the earring junkie that I am, I have another bulletin board with my jewelry on it (or ju-ry for slang). I also have perfumes or "berfume" like I used to say when I was little. Most are gifts from my mom who loves to smell fresh and clean. I love lighting candles in this area because it's in the hallway and somehow soothes my nerves when I'm on my way to the bathroom. Here's a little bit of yours truly in raw form - no makeup, hair nappy, eyes closed with heart wide open! I love sushi! 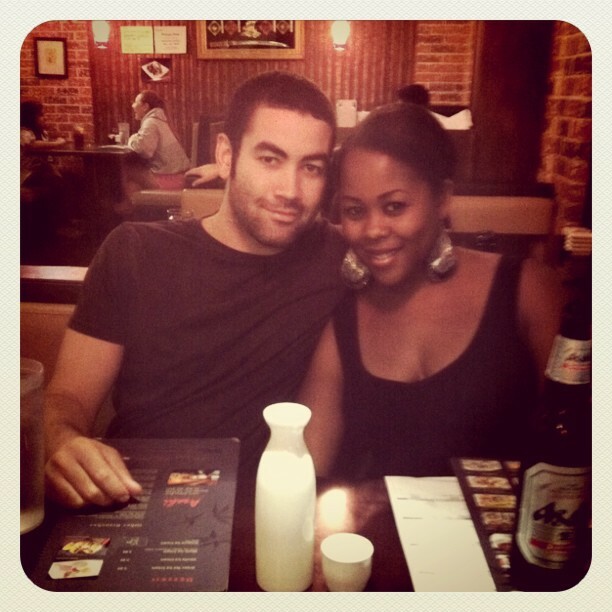 Here's a pic my friend Adelia took of us a couple of nights ago at a sushi restaurant. wow you are such a lovely couple, the love is in the air...all around you :). Earrings on a bulletin board, huh? That's pretty genius.